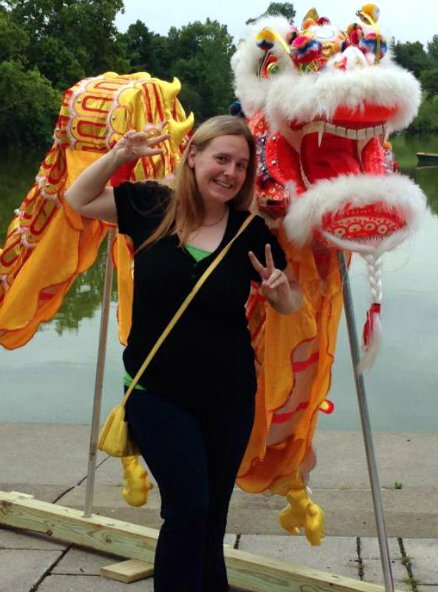 My Blissful Journey: Animal Friends, Plant Life, Hot Temps, and Colorful Meals! Animal Friends, Plant Life, Hot Temps, and Colorful Meals! Last week I took a walk in a nearby park. This nearby park has a Pollinator Garden in it. There were some plants that had already 'expired' for the season but there were several that were left blooming and beautiful including this one so I took a picture. Last weekend I spent commutating back and forth to the fairgrounds. We still camp there and volunteer each weekend on the grounds. This coming weekend there is a folk art festival that we will be attending on the grounds, too! I hope to take more photos of the grounds and of this years festival before we are no longer down there for the winter months. Since Monday was a holiday I didn't have to work so I decided to take Cricket with me. She had fun with my mom and dad's dog Lexi and some other dogs that were down there. She played and walked a lot. On our way home she was sooooo tired! 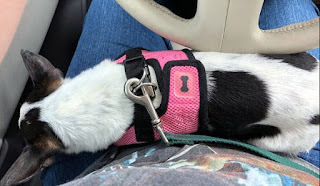 She laid down on my lap while I was driving and fell asleep! She was even sluggish the next day! So cute and so funny! Some of you know I adore goats! Each time I see one I have to spend some time with him/her, make a fuss, talk to them, etc. This is one of the goats I saw over the weekend - last weekend! He was giving me kisses and nibbles! I should be able to see more goats this coming weekend. Usually, at this festival we go to there is a guy who rehabs animals and brings them for the kids to pet. I remember blogging about them before/in previous years. I do have some vegan items to share for Vegan MoFo but first I will get all of the non-food stuff out of the way! It's been a hot summer but I have to say that the last 3 weeks has been a little NUTS! I LOVE hot temperatures but I don't like it when the humidity gets out of hand on top of those hot temps! That is exactly what has been happening these last few weeks. 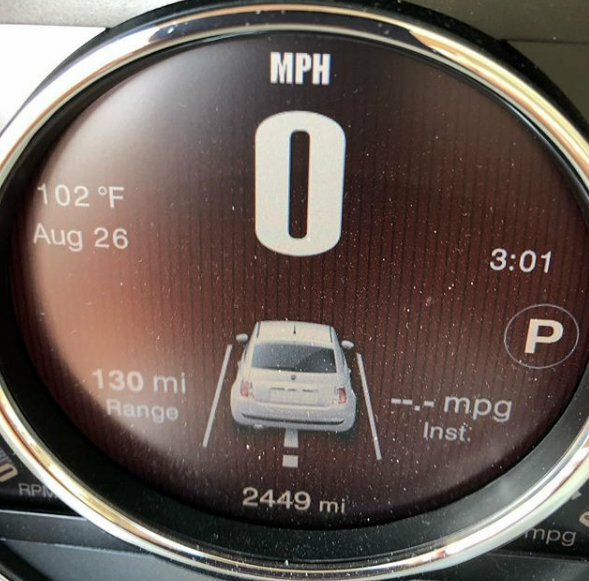 The other day it was over 100 degrees AND I swear it was near 100% humidity...then...the power went out for at least 3 hours! This is the dash of my new Fiat! I have to say I love it more and more each day! I already put almost 2500 miles on it! Now on to the food! Today is COLORFUL Meals! Well, I had to try and fit this into today's prompt for Vegan MoFo! It's last weekend's Vegan Fair Food Option. We ended up going to Stoneboro Fair and there was a Mexican Food Truck there and they were SO NICE! I asked all the 'normal content/ingredient questions' that 'we vegans' tend to - and they told me what everything was made with/how it was made/what it contained! I opted for these Nachos that I customized. 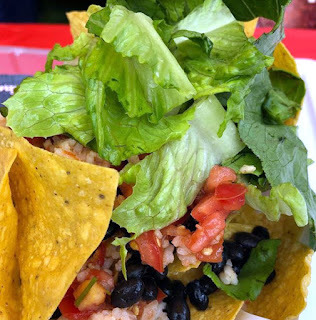 They had Salsa, Lettuce, Black Beans, and Rice. They were tasty! Sometimes...all you have to do is ask, right!? 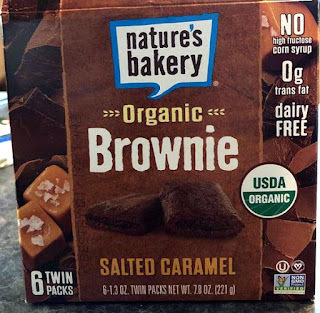 One of the things I have had at the camper all summer - just in case - I got the munchies and couldn't find anything FAST - and/or didn't feel like a sandwich - or cooking - I had these Salted Caramel Organic Brownie things from Nature's Bakery! I've tried their other flavors before but this was a FIRST for me with their Salted Caramel! They are rich, that is for sure! I have to say...I'm a fan! Another thing I wanted to mention...my parents went to Erie the other day and brought back one of the Mad Mex's vegan options for the Angry Hippie Burrito...they offer Daiya Cheese and Tofutti Sour Cream as options! It's been too long since my last trip to Mad Mex! Brownie! My cousin is home from Australia and she gave us a box of gluten-free cake mix for brownies - can't wait to give it a try! I still have yet to try Black Bean Brownies! Have you tried brownies made from black beans yet? 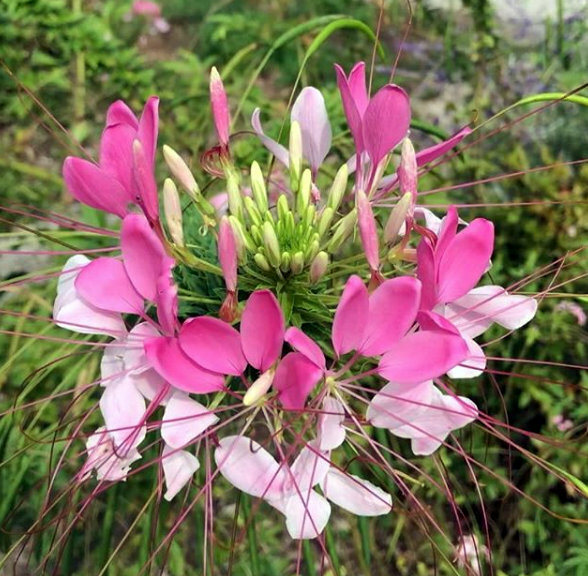 The pollinator garden sounds so nice, and what a beautiful flower! Sweet little Cricket! I like to get over to the Pollinator Garden at least once a year. I figured it was getting pretty late in the summer so I needed to get over there before it was winter! Oooh it sounds like you've been doing such fun stuff! Cricket is so sweet and OMG the goat! How adorable! The nachos look delicious and I've been wondering about those brownies! I'll have to five them a try for those chocolate cravings! I'm trying to get out and do different things so I don't get into a rut. That goat is so cute! I love goats too, but I rarely see them in real life! I love the Nature's Bakery brownies! I've never seen the salted caramel flavor but I need to! I love anything caramel! 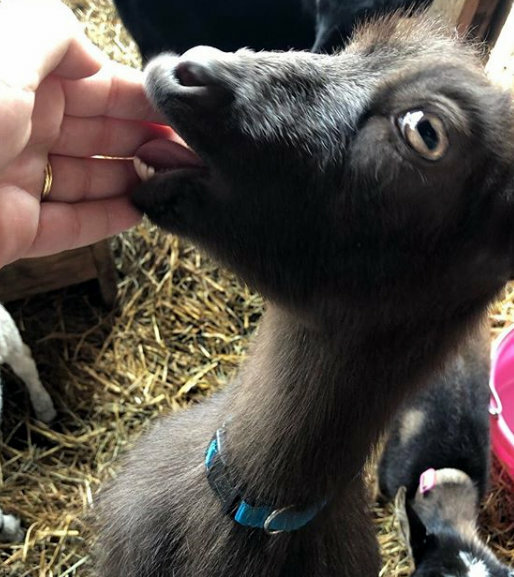 I have more goats for you today! Is Mad Mex a single restaurant or a chain? We have a chain over here called Mad Mex, but I don't think they are international? They recently did start offering vegan cheese (I think most of the mexican chains here do now! ), but alas I think we are still a ways off on the sour cream. Well it's a small chain. I think there might be 7 or 8 locations...but mostly in Pennsylvania. Must be same name, but different chain! Ugh on the heat, humidity makes it so much worse! We're finally getting cooler temps here, now if we could just get some rain! Those brownies are delicious, we found some recently too and a great pre-run snack. We got some rain over the weekend and we are thinking we will get more being on the outskirts of this hurricane. Are your fires any better yet?